When searching for snappy one-liners to compare movies, it's very easy to make a fool of yourself. The Wicker Man is not "the Citizen Kane of horror movies" - not because it isn't great, but because it's not a horror film. The Adjustment Bureau is not "Bourne meets Inception" - because it's a great deal lighter and sillier than either of those. 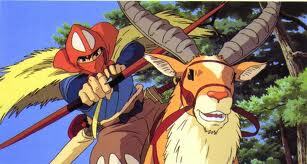 And Princess Mononoke is not "the Star Wars of animation" - because it's arguably a whole lot better than Star Wars. Princess Mononoke is an enchanting, dazzling piece of filmaking, refining and retuning elements from Hayao Miyazaki's previous works while still feeling bracingly original. Its technical perfection in its marriage of hand-drawn and CG animation is matched only by the nuance and vibrancy of its storytelling and the multi-layered subtlety of its themes. It is also the film which finally broke Miyazaki into the West, with John Lasetter of Pixar overseeing the English-language dub. 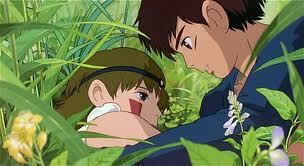 In relation to Miyazaki's back catalogue, the film is closest to his earlier epic, Nausicaa of the Valley of the Wind. Both films depict multiple civilisations at various stages of economic and political development, in the context of a modern world wrestling with the influence of ancient gods and demons. And, of course, both feature female protagonists whose motives and allegiances are not entirely clear-cut. 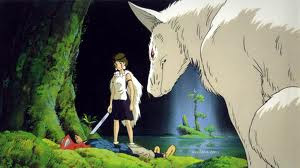 But although it's slightly longer, Princess Mononoke is a much more focussed work. Even when it has to balance multiple story strands which become more and more frantic, it constantly feels like it a film that knows what it is doing and where it is going. As always with Miyazaki, the visuals are beautiful to behold. 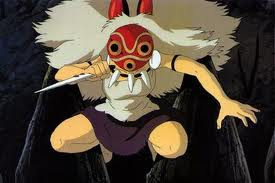 But Mononoke is notable for being the first of his works to incorporate elements of CG animation alongside more traditional hand-drawn techniques. Because of Miyazaki's affection for hand-drawn animation, both in its personal touch and its tactility, CGI is employed only very selectively - the most notable example being in the opening battle between Ashitaka and the possessed boar. CG technology is used to animate the demon worms on Ashitaka's forearm, but because they are carefully coloured and only on screen very briefly, you honestly couldn't tell the difference. Although the film is a PG certificate, there are many moments in Princess Mononoke which are dark, creepy or just plain surprising. In its opening minutes a number of people are decapitated by arrows or have their arms shot clean off in the heat of battle. The writhing mass of demon worms which cluster round the boar are reminiscent of Gerald Scarfe's psychotic animations in Pink Floyd - The Wall. In several scenes characters are bleeding or have some form of life-threatening injury - the camera doesn't flinch, and the implication is that neither should we. And then there is the last 30 minutes, of the Deer God turning to the same void-like black sludge of No-Face in Spirited Away, spreading all over the landscape and destroying all that he touches. 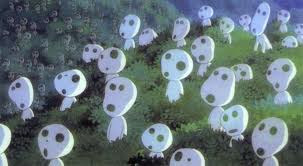 What these moments hint towards is the emotional maturity of Princess Mononoke. It is a refinement of Nausicaa in its depiction of characters who are morally ambiguous. This is a world without absolute concepts of good and evil, in which ideas of right and wrong exist solely within the minds of its protagonists, some of whom have very limited perspectives. The world is one of complex economy and murky Realpolitik, with alliances being made and broken constantly. Few animated films have so brilliantly captured the reality of modern politics while keeping their fantasy world so seamlessly unique. 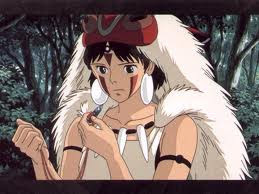 As well as having several interweaving strands, Princess Mononoke is notable amongst animations for having no central protagonist and no-one who is straightforwardly heroic - which makes The New York Post's comparison with Star Wars all the more redundant. All of the characters believe that what they are doing is right. San is defending the Deer God and the wolves whose spirit inhabits her from the encroaching humans, whom she accuses of unduly destroying the forests. The humans in the ironworks believe that the ancient gods stand in the way of their progress, only turning to them in order to exploit their power and win wars. Ashitaka, who could be called our lead character, has both a selfish and an existential bent. He is selfish in that he journeys to find a cure for his curse, and has little time to be delayed by the needs of others. But through his many meetings and coming to terms with the force that is consuming him, he comes to realise his place in the universe and atone for what he has done. At the beginning of the film, he is more impulsive and self-centred, allowing his cursed arm to control him at crucial moments; but eventually, through his attachment to others, its power relents and he learns to live with himself. Like Nausicaa before it, Princess Mononoke is an environmental film in its negative depiction of humans' impact on the world around them. But as before, the film makes the point of focussing on attitude as much as action, and by refusing to caricature humanity as purely and inherently evil. The forest creatures may be fighting back against the humans but they are also warring amongst themselves - the wolves versus the boars, the boars versus the monkeys and so forth. In its characterisation of the gods, the film is much more of an allegory of the Renaissance, with people trying to kill or forget 'ancient Gods' to forge ahead and create a new civilisation. Up until the last ten minutes, it is very even-handed, suggesting that while what the humans are doing is destructive, the vengeance of the gods is hardly better, with both sides prone to being headstrong and impulsive. There are also big spiritual overtones to the Deer God's final act. Having regained his head and slaked his wrath, he gives up his spirit to rejuvenating the forest, drawing comparisons with Christ or the story of Noah and the flood. 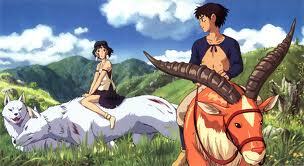 Princess Mononoke continues the trend in Miyazaki's works of equal footing for female characters. Women not only take a more dominant role but their identities are freely accepted, whether at the ironworks or in San's leadership of the wolves. 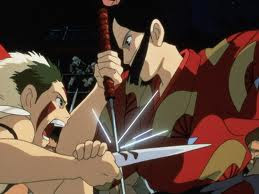 When women claim to be more productive than men and able to defend themselves, Miyazaki resists throwing in a set-piece showing a woman humiliating a man in battle or another such cheap gesture. There is more than enough in the humorous banter between male and female to suggest that these people are not to be messed with, let alone belittled. 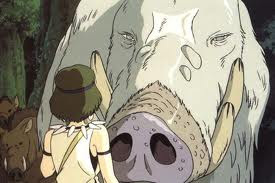 As if we needed any more convincing, Princess Mononoke has moments of pure fantasy which are absolutely to die for. The sequence of the Deer God dissipating into the Earth and turning the whole land green puts even the heaven sequence in Porco Rosso to shame. The marriage between fantasy and reality is perfect, placing moments of visual magic and poetry in the midst of deep personal conflict. San and Ashitaka do not end up together, at least not romantically, but in view of the magic unfolding they learn to recognise each other's differences and gain mutual respect. San learns to tolerate the existence of humans, while Ashitaka embraces nature, in the hope that the others will follow his example. 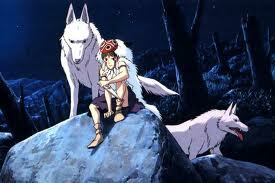 Princess Mononoke is a pure, undiluted masterpiece and one of the very best films of the 1990s. It is a truly outstanding piece of work, whether visually, thematically or technically. Its execution on every level is note-perfect, addressing complicated and grown-up themes while never shutting out the younger viewer. Most of all, it is a film which proves not only the virtues of animation as a medium, but which demonstrates that animation does not have to be inferior to live-action, either in content or delivery. It is a true masterstroke that will stand the test of time.